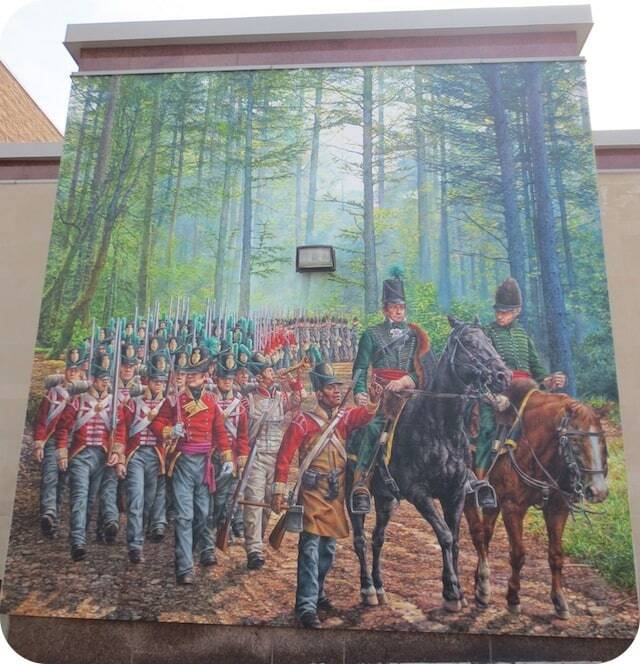 Commissioned by the Islington BIA to commemorate the Bicentennial of the War of 1812, the mural features the three Canadian units that participated in the march: the 104th (New Brunswick) Regiment of Foot, the Glengarry Light Infantry Fencible Regiment, and Les Voltigeurs Canadiens. On July 29, 1813, Lieutenant Colonel Francis Battersby was ordered to leave York (Toronto) with all the soldiers under his command to secure Burlington against an imminent American threat. Dispatched in a “march of extraordinary celerity” along Dundas Street, this force, consisting largely of Battersby’s own regiment, the Glengarry Light Infantry, arrived in time to dissuade the enemy from attacking this key position. However, this troop redeployment left York vulnerable, setting the stage for the second American raid on the town on July 31, 1813. Supported by CIBC, the City of Toronto, Arts Etobicoke, Etobicoke Historical Society, Benjamin Moore, Montgomery’s Inn, Fort York and the Heritage Etobicoke Foundation.